The banking industry is witnessing a pivot to open banking that is partly forced by regulations such as PSD2(Revised Payment Services Directive) in Europe with a vision to ensure high consumer protection standards and enhance competitiveness of the financial services industry. In geographies such as Canada and United States banks are forming consortiums to employ exponential banking to drive customer experience. In other regions such as Singapore, the regulatory bodies such as Monetary Authority of Singapore (MAS) are actively pushing banks to develop and use APIs. As per Everest Group estimates, the IT services open banking market is a US$3.3 billion economy and is slated to double by 2022. Banks are exposing data and services using secured open standards through platforms and Application Programming Interfaces (APIs) to third parties. Application Programming Interface (APIs) can help solve many of the above challenges that Banking and Financial Services (BFS) enterprises face. APIs allow businesses to securely share information with third parties, develop innovative products & services, decouple legacy systems, and provide enhanced customer experience. Accelerated adoption will herald an era of ecosystem collaboration between banks, FinTechs, technology providers, service providers, and peers to provide tailored products and superior experiences. Service providers respond to these demand themes by investing in open banking Centers of Excellence(COEs), certified talent, platforms, and partnerships. 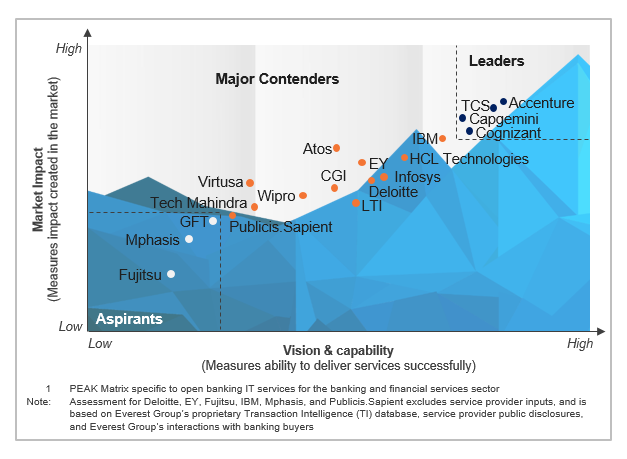 In this report, we assessed the vision & capability and market impact generated by 19 service providers for their open banking IT services capabilities.